Art as Usual: Vacation Mode- Are You Ready? Dreaming about summer vacations today. It's another rainy day and I'm really longing to get out and take a good roadtrip. That has to wait right now, so I thought I'd do a little dreaming with you here. What about you ? Do you have any vacation plans for this summer? If so, or if you're just dreaming like me, here are some Vacation Themed goods straight from Etsy that are sure to inspire! 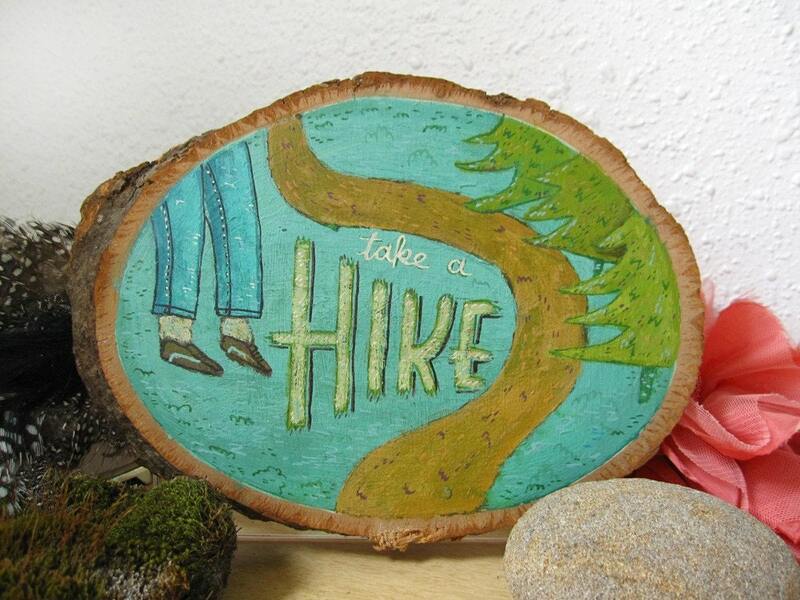 This "take a hike" plaque by Mary Kate McDevitt strikes the perfect tone for me. Our last two summer vacations were to Glacier National Park, and I had a blast last summer doing a little "hiking" with my 5 yr old. 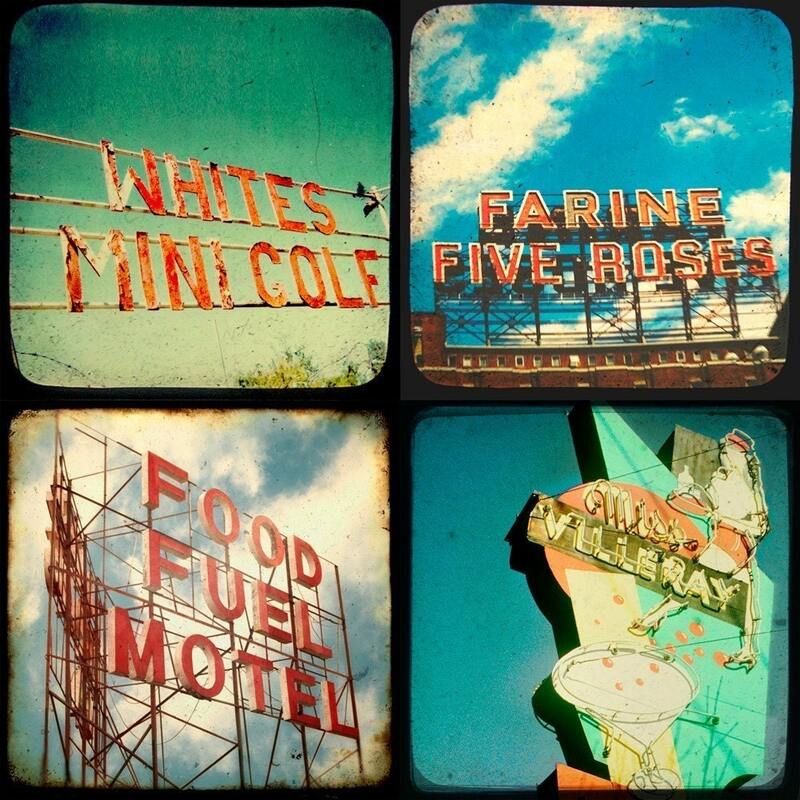 Love the photos in this Roadside Attractions Vintage Sign collection. By Bomobob on Etsy, this is a shop I hadn't found before but now LOVE! 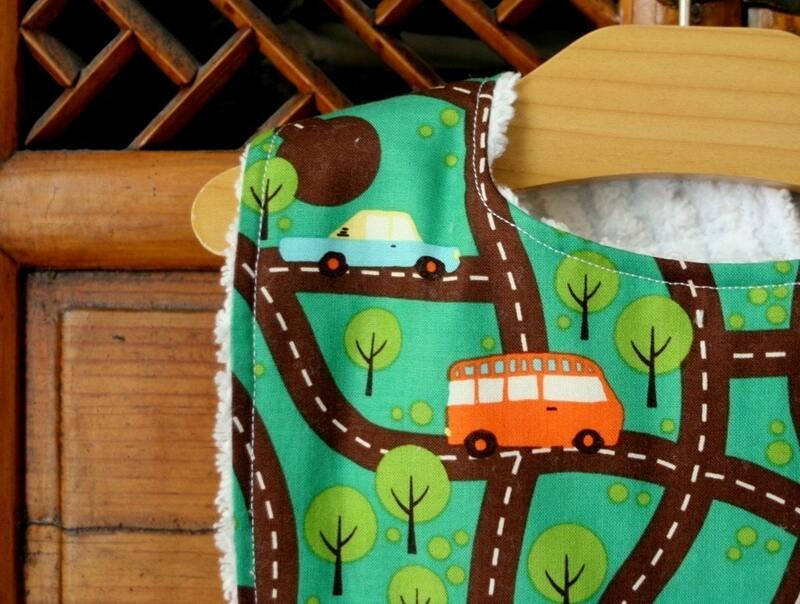 Ok this "roadtrip" bib was just too cute so I had to include it. :) But it would be the cutest vacation-ware ever! I found it in Mountain Aven Baby's Etsy shop. She actually has a couple of cute baby girl dresses using the same fabric I used for my Won-Ton bag a post or so ago. 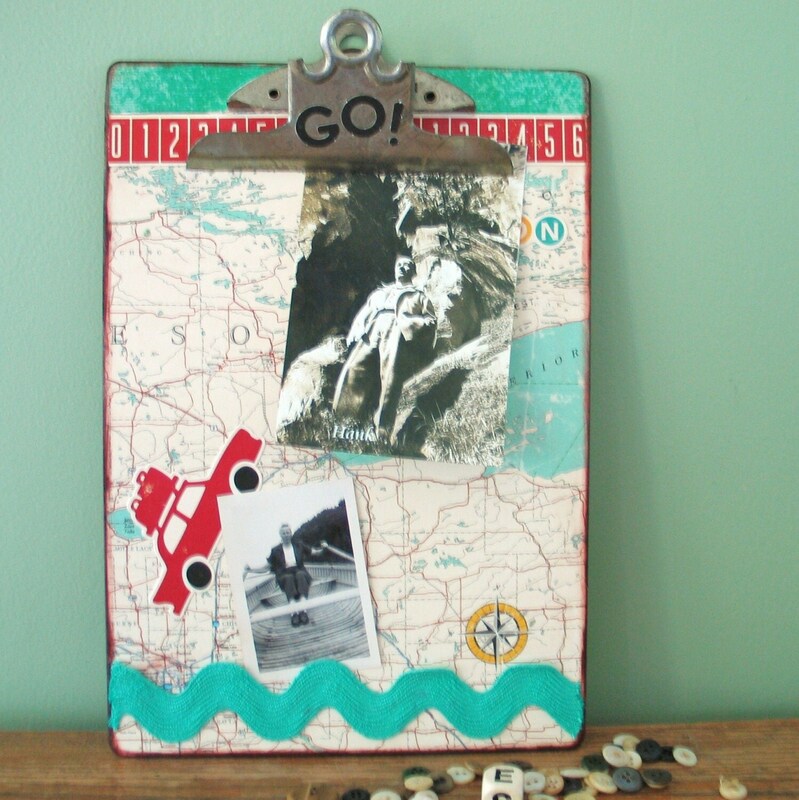 My mom (shameless plug) has a really fun vintage clipboard that she altered with paper and accents for a fun road trip theme. The top photo is one of my grandpa taken while he was on a roadtrip in the '40's. Then there was this id tag necklace that seemed to say it all. The sentiment is a favorite of mine but I love how the tag looks so battered and worn. 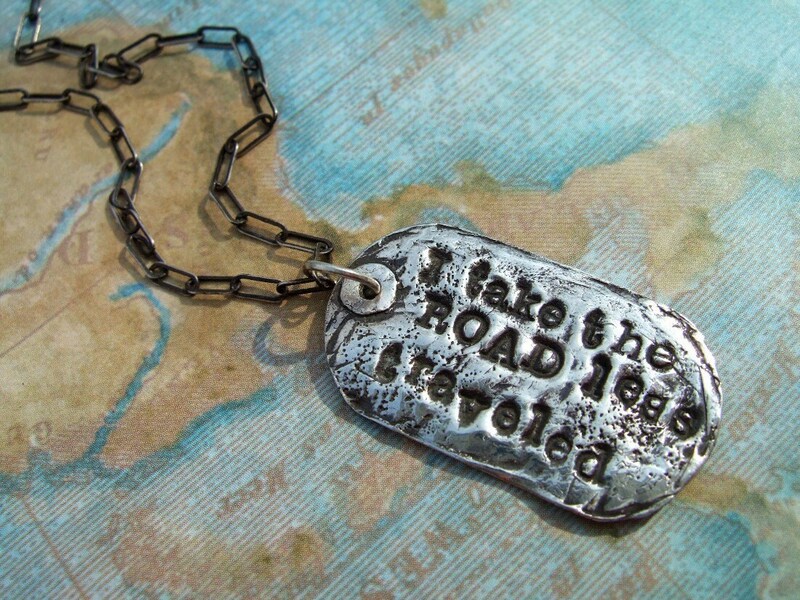 As if it truly belonged to someone who spent their life "taking the road less traveled." I found it in the Etsy shop Happy GoLicky. They strive to make jewelry that makes the "soul smile." I love that sentiment. can i just say how much i love, love LOVE reading your blog!! your words, images and use of font, rock!!!! I am snagging a button and linking to my corner of the blogosphere right now! what a creative idea you had for traveling, keeps your mind off of the rain! it just feels good to come and visit you..thanks for sharing these goodies. i just returned from my summer vacation-- to the oregon coast which was so GREAT- a break from the dallas heat! my husband and i were discussing our next trip this morning- maybe a fall trip to drive along the east coast to see the fall foliage- i've never done that but have always wanted to. and stop in vermont for some syrup!! Hi Jen, I love your blog, the look, the content, everything about it. By the way how are those painting classes coming along? Love to see some of your work!! !